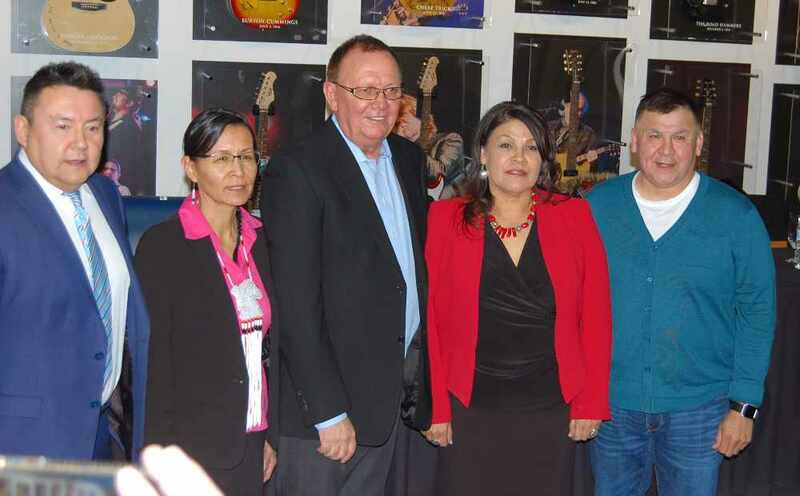 Collaboration, advocating for Alberta’s chiefs, and the importance of honouring treaties were supported by all five candidates vying to hold the title of regional chief for Alberta with the Assembly of First Nations. The candidates, who include two former chiefs and two women, delivered their platforms to about 30 people at the River Cree on Sunday afternoon Feb. 18. Running for the positon are Tsuut’ina First Nation former chief Roy Whitney Onespot, Ermineskin Cree Nation former chief Randy Ermineskin, lawyer Will Willier, Marlene Poitras, newly-named chair of the Alberta government’s First Nations Women’s Council on Economic Security, and Gina Potts, who has served in a number of policy positions for the AFN. Alberta’s chiefs will be casting their ballots on Thursday Feb. 22 to replace Alberta Regional Chief Craig Mackinaw. “It is about restoring respect for our sacred treaties, insisting that they are lived up to and accepting nothing else,” said Poitras, who addressed the crowd first. Willier said the issues that are at the forefront now – reform of the justice system following the not guilty verdict in the Colten Boushie shooting, a new legal framework promised by Prime Minister Justin Trudeau for Indigenous peoples, and the replacement of the Indian Act – all need a legal perspective. “Right now more than ever we need a voice that is strong, that’s insistent, that’s knowledgeable and that’s my intentions, to bring that voice,” he said. Potts emphasized her role as someone who would serve the chiefs and that the AFN needs to understand that. “The mandate and priorities I represent will arise from the Treaty 6, 7 and 8 chiefs,” she said. Whitney Onespot talked about the importance of the Treaties 6, 7 and 8 Nations supporting each other. “I encourage the three treaty areas to unite, to stand up and take our rightful place on the national stage, both at the Assembly of First Nations’ table and …as well at the federal table,” he said. Ermineskin stressed the need to take action now, especially with the federal government promising more funding for First Nations issues. All three treaty areas are represented through the five candidates. Poitras and Willier come from Treaty 8; Whitney Onespot comes from Treaty 7; and Ermineskin and Potts are from Treaty 6. Hal Eagletail, who hosted the event, said no woman has ever represented Alberta as a regional chief. He also noted that it was unusual, although not unheard of, for non-chiefs to be seeking the position.